New Winter 2018: Looking like something a doting grandmother knitted by hand, this baby Christmas ornament for a second birthday is so pretty in pink. The baby girl’s second Christmas personalized ornament will delight parents with its cute design and personal details added in a handwritten font to create a lasting memento of this special holiday season. 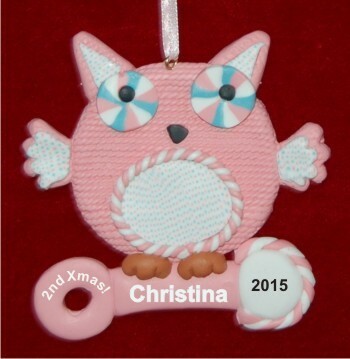 Just one of many personalized girls ornaments in the Russell Rhodes collection, the pink owl second Christmas personalized ornament is made from quality materials that will hold their good looks for many years to come. Celebrate your little gal or share the joy with friends with this baby girl ornament personalized to be perfect.